The school supported Lauren's First and Goal by hosting Patrice for an author's visit. The school was extremely generous, purchasing 30 hardcover copies of the book for every classroom. The PTA also purchased 100 copies to give away to families at their Bingo night and the students and staff purchased an additional 41 copies. Thanks to everyone for their support! The school supported Lauren's First and Goal by hosting Patrice for an author's visit and purchasing copies of Hope is Here to Stay. Just one week after his wedding, Muhlenberg assistant coach Tom Perkovich entered the Buffalo Marathon. Tom presented LFG with a check during the annual camp. Once again, the Dublin Jerome girls' lacrosse team led by cousin Gabriele and Aunt Jean made over 200 neck coolies for the players and coaches at the Otterbein camp. Thank you so much for all your hard work, sewing, stuffing and tying! Thank you to all of the generous staff members at the 7/8 building who participated in "Jean Friday's" during the first marking period. By contributing one dollar to the jean fund each Friday during the months of September and October, staff members raised over $200 for Lauren's First and Goal. Go Rovers!!! Led by Ms. Jillian Brodhead, a group of teachers including Mr. Ruhf, Mrs. Sanal, Mrs.Schuck and Mr. Baum from Lauren's school, Easton Area Middle School 7/8, ran the VIA Marathon in September in support of LFG. 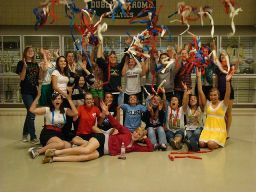 The group raised more than $1,000 in pledges. Lauren's school hosted Patrice for an author's visit and purchased copies of Hope is Here to Stay. Nearly 100 golfers turned out for an event at Morgan Hill and raised more than $2,000 for LFG. Ed and his group have raised more than $5,000 over the last three years. 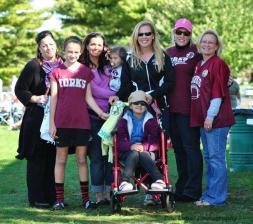 A huge thanks to the Forks Football Youth Sports Organization for sponsoring a chili cook-off in October to benefit LFG. Thirteen families participated and helped raise $639! Special thanks to Fran Tone, Kelli Wilson and the rest of the team moms. Gabriele and Eloise, students at Dubin Jerome High School in Dublin, Ohio organized a paper goods drive at the school to help supply the coaches and volunteers with needed plates, napkins, cups and cutlery at the Otterbein camp. A big thank you to all of the students who participated by donating items. Hayden, a first grade student at Babylon Elementary, was so inspired by Patrice's author's visit and Lauren's story, that he made some home-baked treats and sold them in his neighborhood. Hayden raised $20 and donated it to Lauren's First and Goal. Thank you Hayden! The school supported Lauren´s First and Goal by hosting Patrice for an author´s visit and purchasing copies of Hope is Here to Stay. In Scranton, Pa., Rose and her granddaughter Angelina held a candy sale called "Hugs and Kisses for Lauren" and raised $200 for LFG. They wrapped up Hershey Hugs and Kisses in pretty packages and held a sale. A sincere thank you to Rose and Angelina for their creativity and generosity. The school supported Lauren's First and Goal by hosting Patrice for an author's visit and purchasing copies of Hope is Here to Stay. In addition, 2009 Circle of Strength members were honored during the visit and given Hope Is Here To Stay t-shirts. Miss Goodman's third grade class wrote letters of encouragement to Lauren after the visit. We continue to be amazed at how thoughtful and generous kids can be. Joe, Matt and Lili donated a percentage of their allowance to LFG, totaling more than $50. Thanks guys! Coach Jeff Knarr and members of the King's College football team held a lift-a-thon in Wilkes-Barre, Pa. during the team's spring testing period and raised $700 for LFG. A heartfelt thank you to all of the handlers and beautiful dogs from Lehigh Valley Therapy Dogs who come to the PA camp every year to meet with the children in the Fun Tent. Pictured in the photo are Keila and Lara, two of Lauren's favorites that she met years ago at the hospital, and who come every year to the camp. Mike learned of LFG from his son Case, a member of the Lafayette Football team and LFG volunteer. He generously offered to travel from CT to both the PA and NY camps to take photographs for us and process them for use on our website and promotional materials. His talent, enthusiasm and professionalism make him an invaluable member of the LFG team and his terrific photos capture the action and spirit of the events. Thanks Mike!! Patrice visited this school for one of her author's visits and was joined by the Murphy family, founders of Friends of Jaclyn. Jaclyn and Taryn Murphy are former students of the school and the visit was planned with their fabulous former third grade teacher Karen Gliedman. The school purchased 105 copies of the book for all their second and third graders. Lauren's cousin Owen ran the NYC Marathon in November and raised more than $700 for LFG. He finished under four hours for the third consecutive year. Great job Owen, and thanks to everyone who pledged to help him and LFG! Over $400 was raised by Lehigh Valley area sportswriters and reporters who participate in this annual golf outing, which was held in May. The Lafayette College Student Athlete Advisory Committee sponsored the Hope is Here to Stay 5K in the spring that raised more than $2,560. Thanks to all of the tremendous athletes and the Lafayette community for their continued support. The school supported Lauren's First and Goal by hosting Patrice for an author's visit and purchasing copies of Hope is Here to Stay. Circle of Strength members from years past were honored during the visit and given Hope Is Here To Stay t-shirts. Shawnee students also collected donations for Lauren's First and Goal during a recent book fair. Southampton hosted Patrice as part of their Authors' and Illustrators' Day in March. 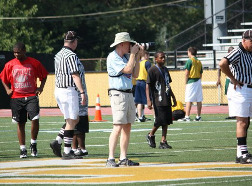 On August 14, 2010, the Suffolk County NY PAL held their first youth 7 on 7 football tournament to benefit LFG. Over 25 youth teams from across Long Island participated in the event, organized by Mr. Lou Bonnanzio, raising over $12,000 for the foundation. Thank you so much to all of the coaches, parents, officials, volunteers and players for taking part in this wonderful display of kids helping kids. Teachers and staff members at Lauren and Gracie's former elementary school contributed $250 to LFG from funds collected during dress down Fridays at the school. In addition to helping with copying and assembling of the PA camp registration booklets, Summer and Capri Troxell, ages 6 and 5, created beautiful works of art and sold their pieces to family and friends, donating all the money they raised to LFG. Thanks girls! We all love Uncle Tony, but sometimes his ‘colorful language' can cause quite a stir among those not accustomed to his command of the English language. Lauren and Gracie made and delivered a special curse jar for Uncle Tony to deposit 25 cents each time he let an explicative slip while we were in Columbus, Ohio for the inaugural Lauren's First and Goal camp at Otterbein College. Holy &%$$!! That %$$#$ Uncle Tony wound up depositing $19.75 into that &$@! jar over the course of three and a half $#% &# days!! Gracie also added a few bars of soap to his bill. Lauren's Aunt Patrice again taught a series of morning yoga/pilates classes on the beach for members of the Idle Hour Beach Club in Oakdale on Long Island, N.Y. Twenty-four moms and kids donated more than $600 to LFG.